Anyone remember these missing guys? Please help find out the rest. Hope that I have got the rest right! Top Row(L-R): Abid Ali, Nitin, Darius, ___, Richard, Selwyn, ___, ___, Arthur. 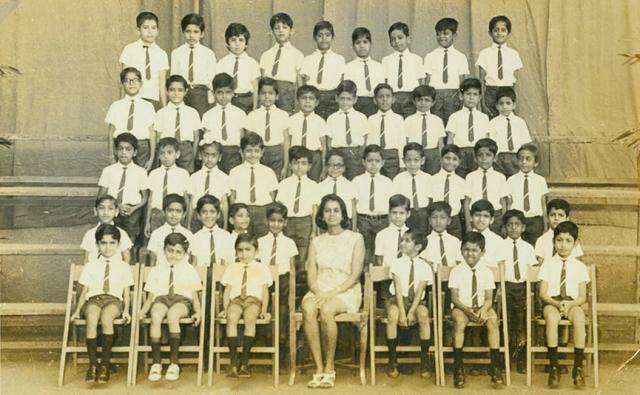 Second Row: Andre?, Mahesh, Brian, Floyd, Pradeep, Phillip, Henry, ___, Glen, David. Third Row: ___, Brian?, Gurpreet, ___, Darcell, Aloysious, Sudhir, Brian, Lawrence, ___, Val. Fourth Row: Noshir, ___, ___, ___, Mark, Mark, ___, ___, Adolph, Vijay. Seated: ___, Salil, John, Tr. Gladys, Savio, Mario, Agnelo. Submitted by dpinto64 on April 11, 2012 - 12:53pm. Submitted by dpinto64 on April 11, 2012 - 12:43pm. Great memories...this was my first year in St. Stanislaus. SO good to see all the guys. But Selvyn...that's not David Pais (though I meet him often and he now lives in Vancouver). Second row from top on right is your truly David (Pinto)...also Rebello House and your buddy chasing feathers flying in the wind during recess. Submitted by hkudrimoti on October 11, 2009 - 10:36pm. Others I recognize but cant remember names! Submitted by balmeida on October 11, 2009 - 9:05pm. This is great - must tell teacher Gladys to see this. Submitted by selvin on October 13, 2009 - 7:44am. This is real cool.. i have this pic.. but during my recent trip to India in December.. could not find it. I guess i've got us all.. except for the guy next to Henry Aguir. Andre, Mahesh, Brian Carvalho, Floyd, Pradeep, Phillip, Henry Agauir,.........? ?, Glen , David Pais. 3rd Row: Francis, Brian D'sa, Gurpreet Singh, Dinesh Kotak, Darcel Tellis, Aloysious Loyola, Sudhir Shenoy, Brian, Lawrence,Darryl, Valentine Dsouza. 4th row: Noshir, Hemant Kudrimoti, Joydeep Ghosh, Mario, _ Mark, Mark D'gama, Girish, Arnold, Alfred, Vijay. Seated: Rohit Saldanha, Salil Kumar, John, Tr. Gladys, Savio Lobo, Mario Quadros, Agnelo Saores.